When we have a sense of purpose and meaning, getting out of bed in the morning, even when we’re far from ‘morning people’ brings a sense of joy. Dr Lissa Rankin, in Mind Over Medicine, writes about how toxic work environments (including feeling like what we’re doing doesn’t matter or, worse, is harmful) can shorten our life and healthspans. Meaningful work can lengthen both. Have you forgotten how to connect (maybe you’ve not yet learned how to) with that expansive, joyful part of yourself – your Self / Higher Self / Miraculous Self or whatever you want to call that part of you that’s beyond limitations of our egos? To have that greater perspective, no matter what’s going on in your life, that helps you when you’re feeling stuck, that welcomes synchronicity and miracles? I wouldn’t be doing this work or living this life if I hadn’t had some major curve balls in my 20s (looking back, long before then – I just resisted it for ages). Over the years, I’ve learned to create more space – using meditation and other tools – to connect with my own inner wisdom. · A safe, confidential space to begin to explore your feelings and thoughts about life, love, the Universe and what you want? · To learn and practice mind/body tools to help you connect with your inner wisdom and stay grounded even as you make big plans? · To learn energy work tools to help you shift any blocks to living with greater purpose, meaning and joy? · To explore potential triggers and causes for not feeling as joyful as you’d like (including any feelings of unworthiness and letting that go, too)?
. To use imagery and other creative visualisation tools to help you create and sustain that higher vision for yourself? · To make peace with your past and connect with the part of you that’s more than whatever has held you back in the past? · To make positive changes to your life and to allow yourself to want what you want, to dream bigger and go for it? · To learn to soothe yourself more easily when you temporarily lose that connection with your Self? · With practice, to rewire your brain so that it’s much easier to visualise the life you want as you manifest it? All my work is collaborative so the choice about the direction we take and tools you learn is entirely up to you. The fact that you’re even reading this, allowing yourself to dream bigger and knowing you can improve things is a big step. I use a range of tools (click HERE for more information) depending on what you want support with and the ways of working you’re most drawn to. Whether you opt for Single Session Therapy for purpose, meaning and joy or have short, mid-term or longer term counselling for purpose, meaning and joy or self-care coaching for purpose, meaning and joy, you will learn simple and effective tools to help you stay motivated and on track. 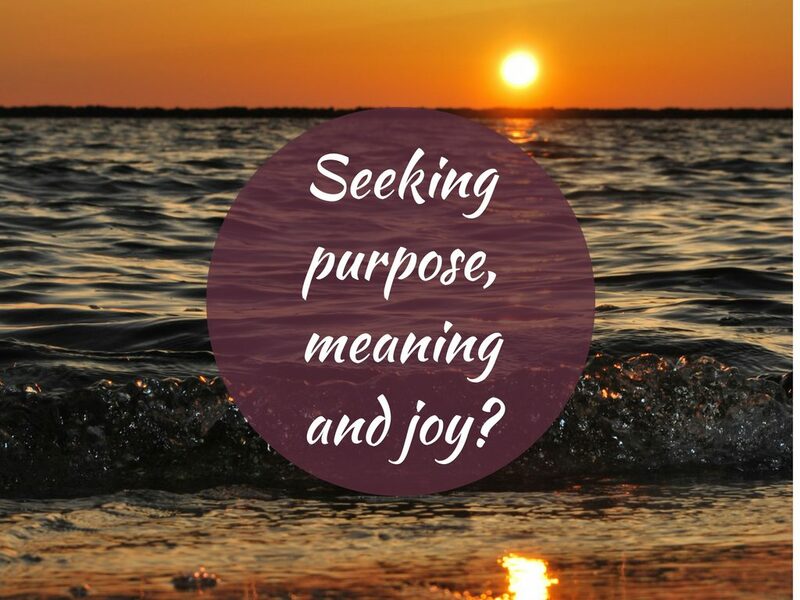 If we work together and this element of my approach interests you (it’s a collaborative process and always your choice), I can teach you some simple and effective mind body and energy work self-care tools to help you find more purpose, meaning and joy. You can help yourself right now by clicking HERE or the image below and choosing the taster videos for breath practices, yoga poses and meditations (such as the yoga nidra) that most closely align with how you’d like to feel.